This page focusses on Apple Macintosh with OS 7 or 8. Note: I'm not a Macintosh expert - could some donate a spare Mac? - comments and help are most welcome! Related pages for different Operating Systems are: Windows 2000 and XP, Macintosh OS 7 of 8 and Macintosh OSX. Select "System Preferences" from the Dock. 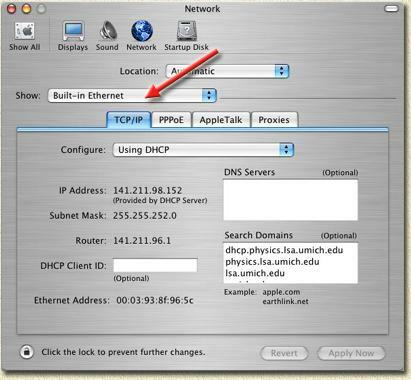 Macintosh - Select "Built-in Ethernet"
Now click the "Apply Now" button. 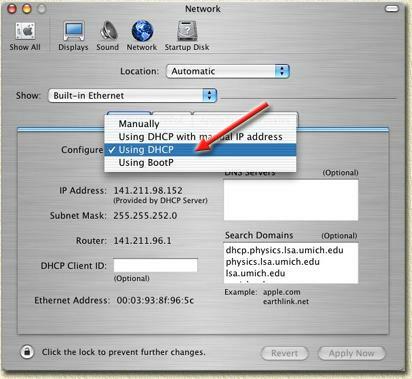 DHCP has now been activated.